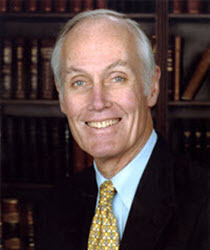 Senator Slade Gorton represented the State of Washington for 18 years in the United States Senate. As a senator, he served in many leadership positions including as a member of the Senate Republican leadership as counsel to the majority leader (1996-2000). In the Senate, Senator Gorton was known for his effectiveness on powerful committees, including Appropriations; Energy and Natural Resources; Budget; Commerce, Science, and Transportation; and Intelligence. He chaired the Science, Technology, and Space Appropriations Subcommittee in his first term, the Interior Appropriations Subcommittee (1995-2001), and the Commerce Subcommittees on Consumer Affairs (1995-99) and Aviation (1999-2000). Prior to his Senate career, he served three terms as Washington State Attorney General and as Majority Leader in the Washington State House of Representatives. Following his Senate career, he was the first permanent appointment to the National Commission on Terrorist Attacks Upon the United States (The 9/11 Commission). Senator Gorton also served as a member of The Commission on the Theft of American Intellectual Property (IP Commission), the War Powers Commission, the National Commission on Federal Election Reform, and the Washington State Redistricting Commission. Senator Gorton has served his state and country in many other ways as well. For baseball fans, he will long be remembered for his leadership in bringing major league baseball back to Seattle and keeping it there by attracting Japanese investment in the Mariners. He received his undergraduate degree from Dartmouth College and his law degree from Columbia University. In 2010, NBR founded the Slade Gorton International Policy Center as a way of honoring the Senator and his lifetime of contributions to the U.S. policy world.